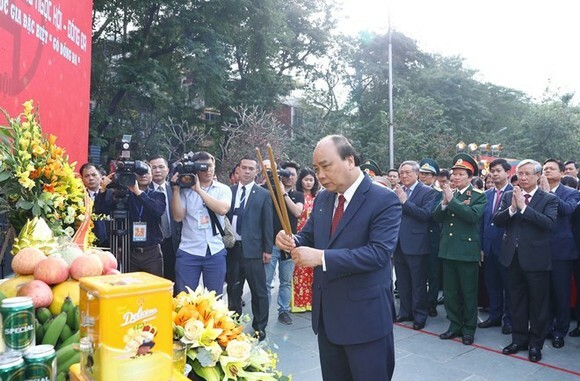 Prime Minister Nguyen Xuan Phuc on February 9 (the 5th of the first lunar month) offered incense at a Hanoi ceremony to celebrate the 230th Dong Da victory against the Qing invaders. On behalf of the Hanoi Party Committee, People’s Committee and people, Chairman of the municipal People’s Committee Nguyen Duc Chung recalled the resounding victory by King Quang Trung 230 years ago in the then Thang Long capital (now Hanoi). That year has gone down to the history of the Vietnamese nation and the heart of the people, the official stressed. Dong Da mound in Hanoi’s inner district of the same name, where corpses of Qing invaders were buried, stands as a symbol of the long-lasting tradition of patriotism of the Vietnamese people, and the Prime Minister issued a decision on December 4, 2018, recognizing it as a special national relic. At this year’s ceremony, Prime Minister Nguyen Xuan Phuc handed a certificate on this effect to representatives of the city and the district.